I reeled in a couple of beauties. 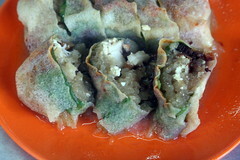 Popiah, a cousin to lumpia, is a "fresh" (that is, not deep-fried) spring roll, often adorned with one or more sauces within and without. 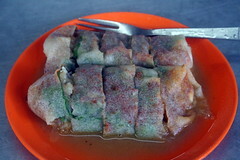 Through the thin wheat-flour skin of this exceptional version (two for rm 2.40, about 65 cents at the time), you can spot the red of chili sauce and the green of some leafy vegetable. In addition to what likely was turnip, the most notable filling was cooked crabmeat. And forgive me, but when I hear the word "popiah," I reach for my pocket fisherman. Virtually, at least.